When looking for a vehicle with style, one such vehicle that is going to give you the sense of style you are looking for is the Volkswagen Golf SportWagen. You will notice the design of the vehicle right away as you are shopping among the vehicles at Royal Volkswagen of Bloomington. The Golf SportWagen has a design to it that is not just for style, but is also known for its space. The Golf SportWagen has been designed so that you can carry a lot of items for a trip. You also have the choice of having the seats up for passengers. 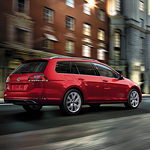 The features of the Volkswagen Golf SportWagen make it a versatile vehicle. One other feature of the vehicle that can actually enhance your experience of the ride is the panoramic sunroof. This can give you a nice view while you are looking riding in one of the passenger seats.